Topics: the scientific journal contains articles devoted to current problems of social philosophy, philosophy of culture, aesthetics, religious studies, philosophy of science and education. 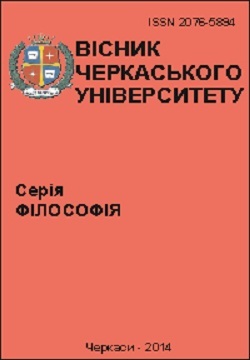 Publications examine the philosophical foundations of modern transformational processes in Ukraine, peculiarities of functioning of moral, aesthetic, political and religious consciousness, analyze urgent issues of the philosophy of education, give the philosophical vision of a wide range of historical and philosophical problems. For a wide range of experts in the Humanities, teachers, graduate students and applicants.